I don’t generally put my own recipes in my Living Cookbook database, but occasionally I do. It seems I found this one worth saving. Make polenta using your favorite recipe. Cut a boneless chicken breast into bite-sized pieces, season it with smoked paprika and cook in a skillet. Heat up spaghetti or marinara sauce. 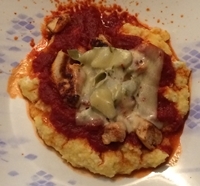 Put the polenta on a plate, add the sauce, put the chicken on top, cover it with a slice of Provolone and microwave it for about a minute. Good stuff! This time I made a couple of variations. I threw in pieces of artichoke heart along with the chicken and used pepper jack cheese instead of Provolone. Even better stuff, I do believe.